From the tips Chambers Bay measures a staggering 7,940-yards and if the wind gets up on this American links style course you can be sure the players will be in for a tough time. Designed by Robert Trent Jones Jr. and opened for play in 2007, Chambers Bay golf Club has already won many accolades and hosted the US Amateur championship only 3-years after opening. The course was built on a former rock quarry and sits in a giant bowl bordered by the railway and Puget Sound to the west. The links style course has no interior water hazards and a single tree. The large undulating greens compliment the wide firm and fast running fairways that sit between large sand dunes and bunkers. 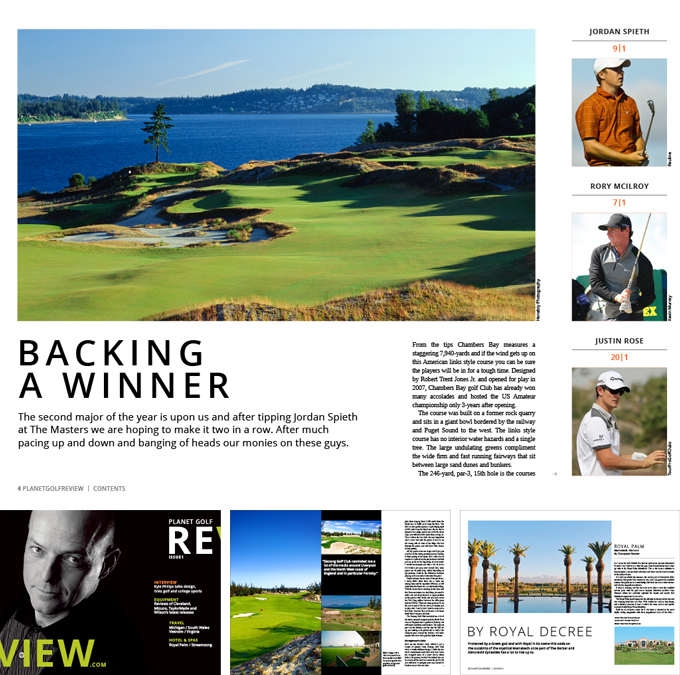 This weeks US Open Championship Review & betting guide forms part of our free downloadable magazine in iBook or interactive PDF Version, which also includes equipment, destination and hotel and spa reviews, plus an in-depth interview with one of the greatest golf course designers of the modern ere Kyle Phillips. To get your free copy follow the links in orange to the planetgolfreview.com website above and below, no email address or sign up needed, you just need an ibook or pdf reader.